Everyone knows what tea is, right? Tea, technically, comes from the leaves of one plant, camellia sinensis. Anything other than the leaves from this plant is not actually tea, although tea is often used as a catchall word to include all the different herbal beverages used these days. There are various types of tea, all beginning with the same leaves. Black tea is created by bruising or crushing the green leaves to expose them to oxidation and allowing them to ferment, then rolling the leaves and drying. This produces a beautifully colored beverage and has the strongest flavor of all the varieties of tea. Oolong tea (pronounced OH-long) is oxidized and fermented the same as black tea, but only for about half the amount of time and the resulting product is a lighter, more reddish beverage with a flavor all its own, somewhere in strength between black tea and green tea. For green tea, the leaves are heated immediately, stopping the fermentation process entirely, then dried and rolled. It produces a lovely light colored beverage, and is said to have the most health benefits. The processing of white tea is similar to that of green tea, but only the unopened buds of the leaves are used. It has the same health properties as green tea, but the flavor is the lightest and most delicate. Good quality tea is a wonderful beverage. Whole rolled or twisted leaves are the best quality; the smaller the leaf, the higher the quality of the tea. The top grades are called Flowery, Golden Flowery or Tippy. Seconds, termed Choppy, are the leaves that have broken into smaller pieces. They brew a great tea, and are usually less expensive. The smallest particles leftover from the tea process, called Fannings, are what is used in tea bags. It brews tea of course, but once tasting a tea brewed from a wonderful full leaf Darjeeling Black Tea, for example, it is hard to return to a tea bag for optimal flavor. Orange Pekoe (rhymes with gecko) is a western terminology applied to a grade of black tea; the word orange in the name has nothing to do with flavor, but could be a reference to the Dutch House of Orange using the name Orange as an implied sea” of some sort. Pekoe may be a westernized interpretation for a Chinese word meaning white hairs, referring to the fine white down on the tea leaves. So, what are herbal beverages called? Herbal beverages are called tisanes, and may be prepared by different methods, usually infusion or decoction. It is incorrect to apply the term tea to anything infused or decocted, although tea is actually infused. Infusion is the preparation method of choice for leaves, flowers or buds; plant matter that will release its properties easily into a drinkable beverage. Placed into heated or boiled water and allowed to steep, the herbs release their goodness into the water, and then are strained out. Decoction is the method used for harder or denser plant materials, such as roots or barks that take longer to release their flavors or health benefits. With a decoction, the plant materials are brought to a boil, simmered gently for 15 minutes or more allowing the liquid to reduce, and then straining. No matter which you prefer, tea or tisane, for pure enjoyment or for health benefits, look for the best quality. 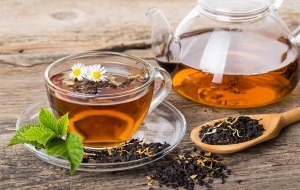 Discover your favorites among the different types of loose teas. Taste the different herbal tisanes and discover new flavors. Above all, enjoy. My name is Chris Rawstern and I have been on a cooking and baking journey for 42 years. Many people have asked what “A Harmony of Flavors” means. Have you ever had a meal where the visual presentation was stunning, the smells were incredible, the taste was so remarkable that you ate slowly savoring every bite, wishing the experience would never end? Visit my Web site http://www.aharmonyofflavors.com, my Blog at http://www.aharmonyofflavors.blogspot.com or my Facebook page A Harmony of Flavors.